Located along the picturesque North Shore, Grand Marais has long been known as a artists’ getaway. More than 65 years ago, the Minnesota School of Art (known today as MCAD) founded the Outdoor School of Painting in Grand Marais. The school soon became an independent entity and changed its name to the Grand Marais Art Colony. Located in a converted church, the school still attracts artists to this small North Shore coastal town, conducting classes for beginners and professionals and providing space for painting, glass, ceramics, printmaking, and other visual arts. The Art Colony has played a large role in nurturing the relationship between artist and outdoor recreation. It’s in that spirit that Grand Marais hosts the community’s annual Winter Arts Festival. In its third year, the Winter Festival actually comprises two events: the Snow Carving Symposium and the Winter Plein Air. The Snow Carving Symposium challenges artists to transform simple blocks of snow into ornate works of art. The carvings will be hosted by local businesses throughout Cook County and will be on display through February 12 (weather permitting). 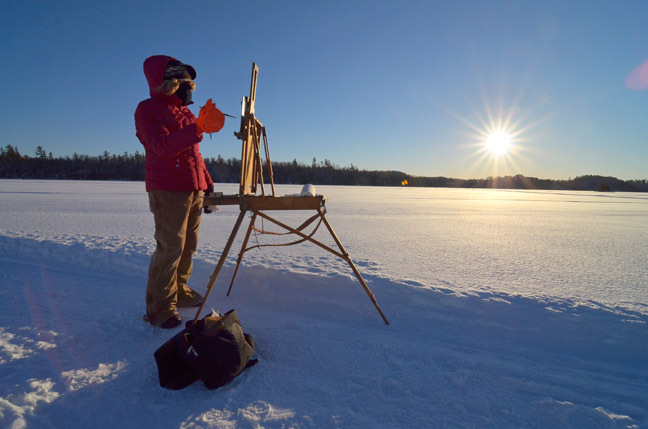 Winter Plein Air is one of the only outdoor painting events of its kind. Adventurous artists ski across a frozen lake near the edge of the Boundary Waters chasing limited daylight and battling freezing temperatures to capture the scenic landscape. An exhibit of the resulting work will be on display at the Grand Marais Art Colony through February 12. One of the more unique art festivals I’ve ever heard of has to be the Franconia Valentine’s Day Hot Metal Pour. The event is exactly as it sounds. The Franconia Sculpture Park is located just two-and-a-half miles from Taylors Falls, just an hour drive northeast of the Twin Cities, and for art lovers it has to be one of the most unique parks around. Located on 20 acres, the park features a rotating collection of more than 95 contemporary art sculptures, featuring local artists to internationally established sculptors. Open free, every day, the park conducts special events throughout the year. On Sunday, February 12, from noon to 5 p.m., watch 12 sculptors brave the cold to pour molten metal into molds to create their works of art. Stay warm over the hot sculpture molds.